This issue spawned the creation in 2003 of the Green Meeting Industry Council, which is based in Atlanta, Georgia. And Chicago’s McCormick Place — the nation’s largest convention facility at 2.6 million square feet — is among those taking the lead in the “sustainable meetings” field. SAVOR… Chicago at McCormick Place this month became the first foodservice company in Chicago to receive a prestigious Level One certification for Food and Beverage for Environmentally Sustainable Meetings, Events, Trade Shows, and Conferences. This certification — based on standards development by the first ASTM International — was created under the leadership of the Green Meeting Industry Council. 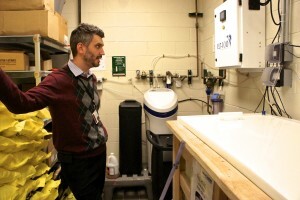 Kevin Jezewski plays a central role in these efforts as is Director of Sustainability and Special Projects for SAVOR… Chicago, the food and beverage provider that runs the foodservice and some other operations for the massive meeting facility. 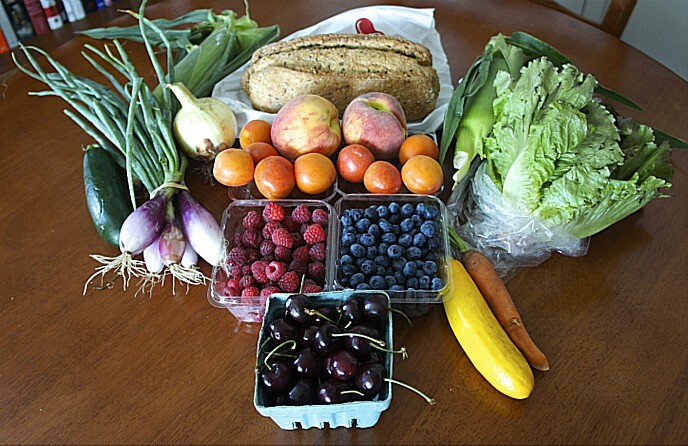 Jezewski has worked closely with FamilyFarmed, a Chicago-based nonprofit that works to expand markets for local and sustainable food, in part by connecting farmers and other producers with big institutional purchasers such as McCormick Place. 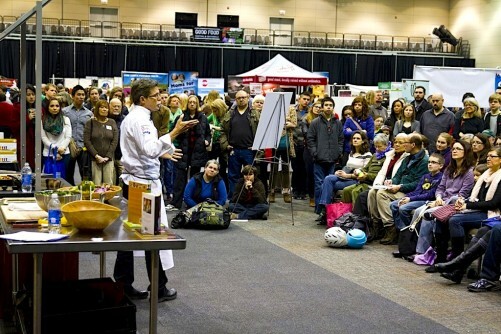 This relationship extends to SAVOR’s participation in Family Farmed’s annual Good Food Festival & Conference, which begin Thursday and runs through Saturday (March 19-21) at UIC Forum on the University of Illinois at Chicago campus. Jezewski will represent SAVOR and McCormick Place today (March 20) on a panel titled “Local Foods Pricing: Making It Win-Win.” The panel, moderated by Eloise Karlatiras of the Green Chicago Restaurant Coalition, will also include Andrew Lutsey of Local Foods, a distributor that is building an innovative retail market in Chicago; Stefanie Garcia of Whole Foods Market, a premier sponsor of the Good Food Festival & Conference; Lior Lavy of artizone, which does home delivery of artisan foods; and Irv Cernauskas of Irv and Shelly’s Fresh Picks in the Chicago suburb of Niles, a food hub that does home delivery of local and sustainably produces meats, produce, and dairy. Jezewski said in an interview that SAVOR took charge of building McCormick Place’s sustainability efforts without being required to do so by the Metropolitan Pier and Exposition Authority (MPEA), which oversees both the convention center and Navy Pier, a Chicago tourist magnet. 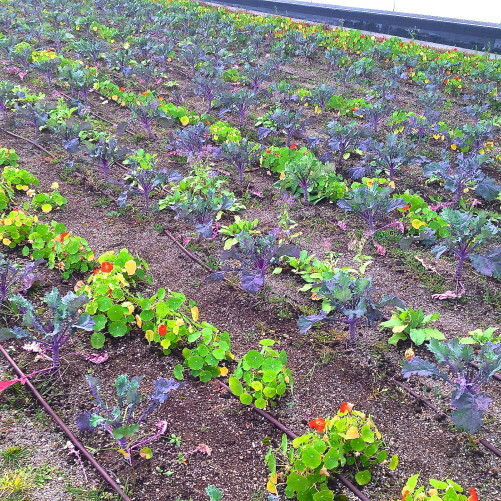 He noted that McCormick Place has been very responsive to the growing demands for sustainable practices among convention planners. He related how one organization whose business McCormick Place was seeking sought a condition that the facility be powered by wind-produced energy. “We collectively took on that challenge, and before their show started, this whole facility was powered by wind,” Jezewski said. 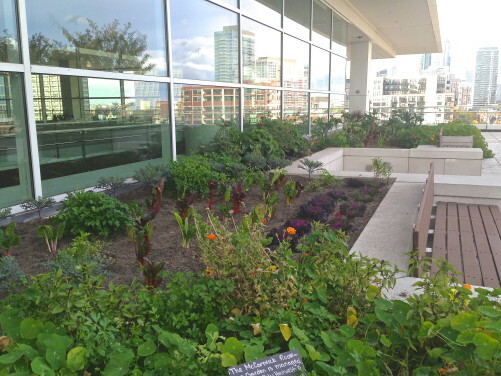 The sustainability efforts extend to the broad rooftop of the expansive West Building on Chicago’s South Side, which is now home to a well-tended garden and beehives that produce vegetables, fruit, and honey for SAVOR…Chicago’s McCormick Place foodservice. Jezewski also expressed praise for FamilyFarmed’s Good Food Festival & Conference, which he credits for enabling SAVOR to connect with “alliance partners” that have benefited their sustainability efforts. FamilyFarmed’s Good Food Festival & Conference began Thursday and runs through Saturday at UIC Forum on the University of Illinois at Chicago campus. Members of the public can purchase tickets for all segments. The first two major portions are aimed largely at those with a professional, financial, or activist interest in the Good Food movement: the Good Food Financing & Innovation Conference on Thursday, and Trade Day during the day hours on Friday. The main events designed for the general public at the Localicious food and drink tasting party on Friday evening, and the Saturday Good Food Festival, the big celebration of the fast-growing Good Food movement. For more information about the three-day event and to buy tickets, please visit the event website. This entry was posted in Rooftop growing, Sustainable conferences, Sustainable meetings and tagged FamilyFarmed, Good Food Festival & Conference, Green Meeting Industry Council, McCormick Place convention center, SAVOR...Chicago at McCormick Place, sustainable conferences, sustainable meetings. Bookmark the permalink.